Ստեղծագործության տները կիրառվում են չինարենում, մասնավորապես առօրյա դարձվածքներում և արտահայտություններում, ինչպես, օրինակ, Գլուխ 3-ի վերջին տունը. Այս հատվածը, մեկնաբանվելով ավելի հակիրճ ձևով, դարձել է չինական ժամանակակից ասացվածք. Ընդհանուր օրինակներ կարելի է հանդիպել անգլերեն թարգմանությունում, ինչպես, օրինակ, Գլուխ 1-ի 18-րդ տունը. Այս հատվածը հակիրճ տեսքով ամփոփվել է անգլերեն հետրևյալ ասացվածքում. Թարգմանիչ Սամուել Բ. Գրիֆիթն առաջարկում է լրացուցիչ գլուխ՝ «Սուն Ցզին և Մաո Ցզեդունը», որտեղ մեջբերված է «Պատերազմի արվեստի» ազդեցությունը Մաո Ցզեդունի պարտիզանական պատերազմի, Ձգված պատերազմի և Չինաստանի հեղափոխական պատերազմի ռազմավարական խնդիրների վրա։ Այն ներառում է նաև Մաո Ցզեդունի խոսքը. ↑ Smith (1999), էջ. 216. 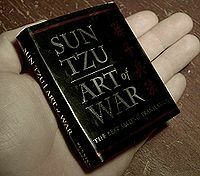 ↑ Giles, Lionel The Art of War by Sun Tzu – Special Edition. Special Edition Books. 2007. p. 62. ↑ Lewis (1999), էջ. 604. ↑ 5,0 5,1 5,2 5,3 5,4 5,5 Gawlikowski & Loewe (1993), էջ. 447. ↑ Mair (2007), էջեր. 12–13. ↑ Mair (2007), էջ. 9. ↑ 8,0 8,1 Mair (2007), էջ. 10. ↑ 9,0 9,1 Gawlikowski & Loewe (1993), էջ. 448. ↑ 10,0 10,1 10,2 Gawlikowski & Loewe (1993), էջ. 449. ↑ 13,0 13,1 Griffith, Samuel B. The Illustrated Art of War. 2005. Oxford University Press. pp. 17, 141–43. ↑ Yevgenia Albats and Catherine A. Fitzpatrick. The State Within a State: The KGB and Its Hold on Russia – Past, Present, and Future. 1994. 0-374-52738-5, chapter Who was behind perestroika? ↑ Durrant, Stephen (1977). 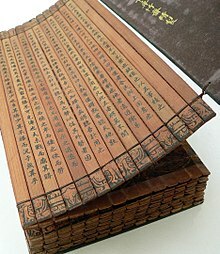 “Manchu Translations of Chou Dynasty Texts”. Early China 3. [Cambridge University Press, Society for the Study of Early China]: 52–54. https://www.jstor.org/stable/23351361. ↑ Durrant, Stephen. 1979. “Sino-manchu Translations at the Mukden Court”. Journal of the American Oriental Society 99 (4). American Oriental Society: 653–61. doi:10.2307/601450. https://www.jstor.org/stable/601450?seq=2 pp. 654–56.